What if you could simplify and standardize all your systems? What if you could make the most of what you have, while moving to a trusted and secure platform that gives you the ability to innovate like never before? IT must keep up with the demands of business, but still lead the way to innovation that fuels growth. Eliminate excessive complexity and inefficiency in your datacenter—without leaving behind existing investment. 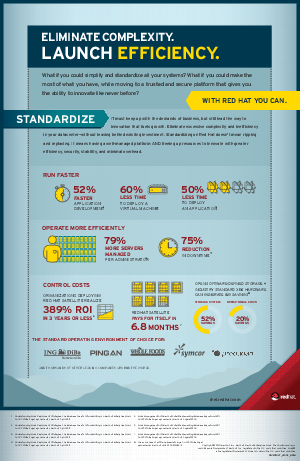 Standardizing on Red Hat doesn't mean ripping and replacing. It means having a well-managed platform AND freeing up resources to innovate with greater efficiency, security, stability, and minimal overhead.